The regurgitated lung of an instance of RPC-380-1, cleaned. Containment Protocol: Instances of RPC-380-1 are to be contained in standard airtight containment cells. Personnel requesting to interact with instances of RPC-380-1 are required to wear class-4 biohazard suits. Amnestic use may be granted to personnel after interacting with instances of RPC-380-1. At least 12 vials containing RPC-380 solution are to be kept in a secure cryogenic locker in the office of Dr. Eckert Letner. In the event of a breach of containment, class-A biohazard protocol is to be initiated. Description: RPC-380 is an anomalous form of bloodborne virus that alters the psychological and physical makeup of infected humans. RPC-380 will enter a 1-2 week incubation period upon infecting an individual. After the incubation period, individuals infected by RPC-380 will begin to experience symptoms such as fever, nausea, dissociative amnesia, internal pain, and decreased motor ability. Upon development of symptoms, individuals infected by RPC-380 are then designated RPC-380-1. About 2-5 days after the onset of symptoms, instances of RPC-380-1 will begin to experience the long term effects of RPC-380. 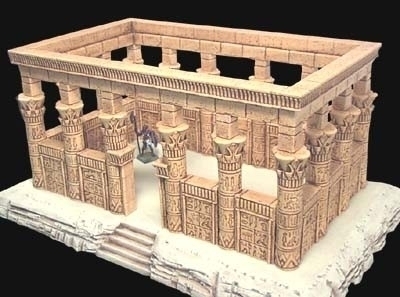 RPC-380 will begin to transform internal organs into miniaturized structures of Ptolemaic Egyptian architecture. Organs transformed by RPC-380 will be either regurgitated or forcibly removed by RPC-380-1. Despite the loss of major organs, RPC-380-1 instances will remain alive. RPC-380-1 instances will enter a state of obsessive behavior about 2 weeks after infection, attempting to arrange removed organs in patterns resembling urban planning. Addendum-1: The first known record of instances of RPC-380-1 was noted by Edward Linderbough in 1908. Linderbough documented in his journal his encounter of a group of natives outside the Temple of Dakka, near the present day Aswan Dam. Following Linderbough's departure, four vials of RPC-380 infected blood were frozen and put into Edward Linderbough's personal collection. Following Linderbough's death in 1913, the vials were successfully brought into Authority custody. Addendum-2: In 1997 an outbreak of RPC-380 was discovered by Authority personnel. The infected individuals were successfully brought into custody, and a full scale documentation process of the symptoms and effects of RPC-380 began and was completed in 1998. Approximately 5 months after the outbreak, fragments of the original mosaics at the Temple of Dakka taken by Linderbough surfaced. Excerpts from Linderbough's writings suggest that RPC-380 was utilized as a type of entertainment for certain Ancient Egyptian monarchs. Addendum-3: Instances of RPC-380-1 have begun developing hostile behavior towards other instances of RPC-380-1. Instances of RPC-380-1 will now actively attempt to locate and attack other instances of RPC-380-1. RPC-380-1 will attempt to breach containment in order to attack other instances. RPC-380-1 will vocalize messages directed at other instances at all times except during discharge of affected organs. A list of recorded vocalizations is available below.